Popular replacement stair and upholstery tool spare part for Dyson DC01, DC03, DC04, DC07 and D.. Compatible crevice tool for select Dyson vacuum cleaners. Great replacement part if you have lost.. 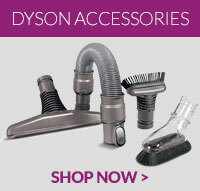 If the current hose on your Dyson has become damaged or worn over time, it is time to replace it wit.. Compatible grey Dyson vacuum cleaner swivel dusting brush for DC01, DC03, DC04, DC07 and DC14 m..